Graduating from Carmel College of Arts, Science and Commerce for Women in 2013, Cliszma D’Costa, a student of psychology, decided not to follow the herd in pursuing a post graduate degree in the same area. 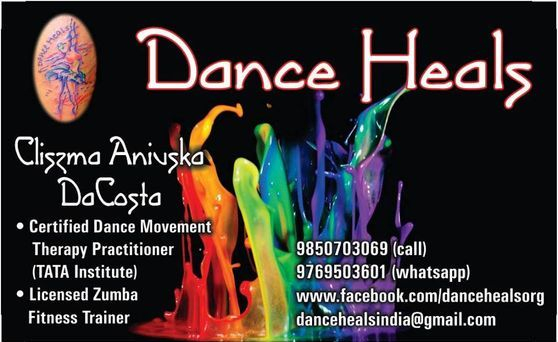 Instead she followed her heart and blended two of her greatest passions, dance and psychology, to join an eight month course at Tata Institute of Social Sciences in Dance Movement Therapy (DMT) in July 2014. ‘I never liked learning by rote in college as that is what our education system demands. This course was the right combination of two things I love and it was more practical in nature.’ DMT concentrates on feeling and understanding and is, therefore, experiential. Students of this therapy are expected to connect experience to theory and not be limited to textual information. Apart from being an aid to the social development of individuals, DMT provides relief from trauma and builds self-confidence in patients who have been emotionally scarred. The therapy is based on the premise that dance can be used therapeutically to bring about integration in emotions and cognition, as well as the physical and social aspects of an individual’s life. Indeed dance has been used for therapeutic purposes for eons, but it was only in the 1940s that it began to be conventionally recognised by the medical fraternity as a means of healing. It was Marian Chace – dancer, choreographer, dance teacher and eventually therapist who, on observing her students’ positive reactions to dance training, began her pioneering work in this field. Today DMT is used in education, mental health, medicine and other spheres with optimal results. To obtain a better understanding of DMT we must remember that it functions on the basis of the interaction of the mind with the body and therefore both conscious and unconscious actions are interpreted as reflecting an individual’s personality. Clients who suffer from dissociation, such as battered women, may suffer from inexplicable muscle pain. This is a psychological phenomenon and not a physical one. DMT is as yet a developing field with plenty of room for research and experimentation. 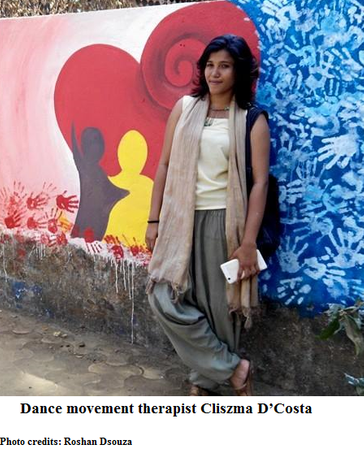 Cliszma studied jazz, ballet and contemporary dance at Danceworx Academy of Performing Arts in Bandra, Mumbai, to facilitate a wider range of movements. While DMT is not a dance class, therapists differ in their use of improvised movements and choosing a particular dance style in their sessions. However, the bottom line is that the movement must resonate with the client in question. The therapist is there to facilitate movement. Cliszma herself selects movements influenced by her education in jazz. The session begins with an opening ritual where all clients make the same movement along with vocal sounds or a rhythm. This sound could be gibberish or a statement, for example ‘I am beautiful’, which is also represented through the movement. Cliszma says, ‘It’s an opening to the therapy session… the start to the creation of a safe space for movement interaction, as rituals in our culture hold a very auspicious meaning.’ DMT believes that movement says more than words, but includes the use of words, art and elements of drama to aid the healing process. Next the introduction takes place, especially if it is a new group of people. It is followed by a warm up, the process or therapeutic work, relaxation and a closing ritual similar to the opening one. ‘This is the basic structure. We add to this structure if we feel the client needs it,’ says Cliszma. During the eight months of Cliszma’s DMT course, one month was devoted to an internship with EARS (Education Audiology and Research Society). She had to work with deaf children which was a challenging experience as communication was difficult. Here she helped the children who were unable to form language with rhythm and recall by synchronising verbal cueing with a movement sequence. She has been involved with underprivileged children with ADHD or dyslexia and some children with both. She would usually take fourteen to eighteen students at a time. Cliszma has had sessions with girls who were displaced from their homes after the 1992 riots in Mumbai through an NGO called Yuwa, and more recently she has had a workshop with children infected with and affected by HIV through Human Touch in Goa. Many are relieved of physical aches and pains after feeling an emotional release with the DMT sessions. In some cases, clients are asked to look at themselves in mirrors using different facial expressions, or a ‘wisdom circle’ is set up where a prop is passed around and whoever receives the prop has to share something while the others listen quietly. Many spoke of the things in life that make them happy and sad. Most of these clients do not possess the clarity that will allow them to see the cause of their present condition. These techniques create an awareness and allow the clients to think for themselves. The dissociation they experience is bridged by helping them reconnect their minds with their bodies. This shows DMT to be a palpably effectual tool in the emotional, mental and even physical healing of individuals grappling with problems in those areas.